The German Data Forum advises the federal government and the governments of the Länder on expanding and improving the research data infrastructure for the empirical social, behavioural and economic sciences. It was founded in 2004. As an institutionalised forum for dialogue, it facilitates a continuous exchange between data producers and the data users in science and research with the aim of improving access to high-quality and scientifically potent data. These data are a product of public, private and scientific activities. 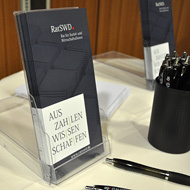 The German Data Form hosts the Conference for Social and Economic Data (Konferenz für Sozial- und Wirtschaftsdaten, KSWD) every three years. It serves as a platform for discussing topics pertaining to empirical social, behavioral and economic data as well as process-produced or survey-based data production. Participation is open to all interested researchers. The German Data Forum hosts colloquia, panel discussions and workshops that foster an ongoing exchange between researchers and data producers. The German Data Forum consists of eight representatives from social, behavioural and economic research, who gain legitimacy by election, and eight representatives of major data producers. This mode of equal representation ensures a broad range of expertise on the committee. The German Data Forum plays a key role in developing research infrastructures in the social, behavioural and economic sciences and is committed to creating research-friendly legal and political frameworks. Moreover, the German Data Forum coordinates 31 research data centres, which are accredited according to its guidelines. The research data centres work together in the Standing Committee Research Data Infrastructure, or FDI Committee for short. The German Data Forum has created an infrastructure enabling researchers to gain flexible access to a wide range of data. 2 members from the area of science-based data production.